It is an experiment made from scrap parts around the house. Thank you very much for contributing your solar parabolic experiment with us. Judging from the photo it looks quite impressive. How has it performed for you? And, What materials were involved in it's construction? I bought some from eBay but I think they were too expensive. Try these guys. I haven't used their product but it is one complete mirror and should work better. When you glue it to the dish, you need to make a form so you can clamp it to the dish for gluing the mirrors. It is extremely important that the mirror is glued flush to the surface of the dish or the mirror angle will be wrong and the sun's rays will not be focused at the focal point of the dish. I thought of pouring cement into the dish to use as a form. I am sure there is a better material to use. Note: Be very careful when gluing the mirrors to the dish surface. The mirrors need to lay exactly flat on the surface of the dish antenna. It works best in the afternoon when the sun is somewhat lower in the sky. You might consider old CDs. Here is a link to one. What reflective material did you use on the dish? It looks like a bunch of small mirrors in the photo. Are they glass, plastic, metal? 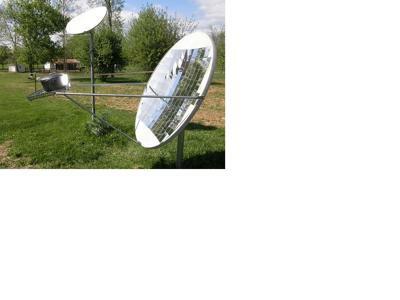 I have a satellite dish that I plan to convert into a solar cooker (to complement my Fresnel lens cooker) but I don't want to cover it with Mylar, and have been looking for an alternative. Where did you get the material that you used? What have you been able to cook with the dish? Is it easy to cook with?